Growing up in California in the 1960’s our family was proudly Irish American. My parents had left New York in the late ‘50s with their 3 small children to find opportunity in the rapidly growing, post- World War II Golden State. But moving 3000 miles away from grandparents, aunts, uncles and cousins limited the knowledge of our family history for me and my siblings. Fortunately, today the availability of on-line genealogical resources and DNA matching has mitigated that, creating opportunities not only to discover family relationships but also to piece together the story of immigrant families in American history. In my case, those are the stories of families from Moycullen. 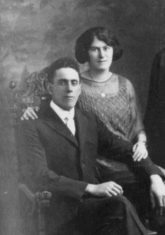 My grandparents Michael Andrew O’Halloran and Winifred Cloonan left for New York in the early 1920s at the end of the last significant wave of Irish immigration to the United States. Although Michael Andy and Winnie were both from Rosscahill, their families originated in Moycullen; the Hallorans from Killagoola and the Cloonans from Tumnasrah. I had always assumed the life of our family in America had started with my grandparent’s migration, but it’s been exciting to discover that in fact members of their respective families had left Moycullen years earlier for locations in America as diverse as Washington DC, the nation’s capital; the silver mines of Virginia City, Nevada; and the far off Golden Gate of San Francisco. This, the first of an occasional series, looks at Hallorans from Killagoola who found their way to Washington, DC before and after the American Civil War (1861-1865). In the same way Whitehall is popular shorthand for the British Government, Foggy Bottom is understood by Americans to refer to the US State Department headquarters, after the Washington DC neighbourhood in which it is located west of the White House. So named for the abundant fog that hugs the bottomlands of the eastern shore of the Potomac River, Foggy Bottom in the mid-19th Century was a gritty industrial zone and one of three noteworthy Irish neighbourhoods in the District of Columbia. It was to here that Michael Andy’s uncle James came in 1854. James Halloran was born in Killagoola, the son of Ulick (Ullieg) and Catherine Clancy. Married to Bridget Keady from Knockaunranny in 1851, the couple had a son and a daughter, Martin and Honor, and were expecting another child at the time they boarded the SS Eva in Galway City bound for New York in the summer of 1854. The Hallorans weren’t the only Moycullen people aboard the Eva as it entered New York Harbour. The Eva’s manifest shows Bridget’s 50-year old parents, John and Bridget Keady (Bridget herself being a Halloran from Knockaunranny) and three of her brothers too. Among the 60 or so other passengers, families of Kynes, Flahertys, Conneallys, Hurneys, Clancys and Lydons could have been of Moycullen as well. It’s not known exactly when James and Bridget arrived in Washington DC. Their third child, Mary was born in New York City shortly after they arrived. But by 1857 when their fourth child, James, was born they were already resident in the Federal City along with the extended Keady family (several of whom incidentally changed the spelling of their name over time to Cady as some of the Hallorans changed to Hollerans). The greater mystery is why Washington DC for the Hallorans? The vast majority of Irish emigrants in the 1850s settled in and around New York and Boston. As the start of the Civil War approached, Washington was a semi-rural city of 50,000 people straddling the southern slave-owning states and the industrial northern states. Although it was the national capital, Washington had less than one tenth the population of New York. Washington also wasn’t known for its salubrious climate. Most residents who had the means left each year to avoid the hot, humid summers. George Templeton Strong, a visitor to the capital in the 1860s, was famously quoted as saying: “Of all the detestable places Washington is first. Crowd, heat, bad quarters, bad fair [fare], bad smells, mosquitos, and a plague of flies transcending everything within my experience… Beelzebub surely reigns here, and Willard’s Hotel is his temple”. Desperate people escaping An Gorta Mór would not have been choosy. It’s likely there was an earlier familial connection to Washington for the Hallorans and Keadys. The Catholic cemeteries in and around the Capital have an inordinate number of 19th century Halloran/Holleran and Keady/Cady graves, among the earliest of which was a Thomas Holleran born in Gortnandarragh. In the end, it was probably the availability of work and the existence of an Irish community that would have attracted James Halloran to Washington. Thousands of Irish immigrants had already settled in Washington in the early 19th century, drawn by the construction of the Chesapeake and Ohio Canal which began in 1828 and was completed in 1850. Foggy Bottom. Photo Credit: GWU. By the time James and Bridget had settled in Foggy Bottom, a new source of employment became available. Washington was one of the last cities on the Eastern Seaboard to convert from candles and oil to gas lighting. 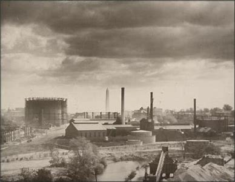 The gasworks in Foggy Bottom became a major source of employment and the neighbourhood which before had been comprised largely of skilled tradesman became one of unskilled laborers, most of whom were Irish and German. It would have been here that James Halloran and his Keady brothers-in- law would have found work as manual labourers. Washington grew during and after the Civil War and much of the growth was due to Irish emigration. In 1865 just as the Civil War was ending, Ulick Halloran of Killagoola, nephew of James and namesake of his grandfather, arrived in Washington along with a Bridget Flaherty, likely also of Moycullen. In 1873, they wed and settled in a brick row house on 23rd Street NW in Foggy Bottom. By 1880, if Foggy Bottom was “Little Ireland”, 23rd Street NW between M and L Streets was “Little Moycullen”. In the middle of the block of row houses were Ulick and Bridget Halloran and their family of three children. Boarding with them was a nephew, yet another Ulick Halloran from Killagoola, and a servant girl from Moycullen, Kate Holland, daughter of John Holland and Mary Earner. They would later marry. Down the road lived the family of Redmond and Honora Sullivan also from Killagoola, next door to Mathias and Mary Noone from Knockaunranny. On the other side of the Halloran’s were two other row houses of Keadys and Flahertys from Moycullen. Emigration to Washington from Moycullen continued until at least the turn of the 20th Century. Federal Census records for 1900 show that Ulick Halloran and his family still lived on 23rd Street NW and that his household had been joined by his brother Andrew Halloran and nephew Michael Sullivan, both of Killagoola. Andrew had emigrated in 1889 and Michael in 1896. Both had found work at the gas works in Foggy Bottom. In the end though, the 1900 Federal Census also tells the story of change in Foggy Bottom. The closing decades of the 19th century saw most Irish and German residents with means leave to more middle class neighbourhoods. For the most part Foggy Bottom became home only to the poor. By 1900, the Halloran family were the only Irish left on the block that had been a Moycullen enclave. Gone were the Keadys, Flahertys, and Noones. Ulick would pass away the following year as would his widow Bridget in 1906. Her passing marked the end of the Moycullen presence on 23rd Street NW. This page was added on 05/06/2018. Very well written and interesting. I’d love to see more articles like like it, and hope to be able to connect to my Hallorans from the area.